Is it critical of the government? There are some bits which are critical. But there are some bits which are positive to government. We talk about their achievements and we talk about their failures. Are there any particular government figures that you think could maybe be identified in this play? Have you based any of the characters on current ministers or figures within the government? We have so many characters in the play and it’s just an abstract form of art. The characters are like some of the characters we have in government today. There are characters like some of the opposition people we have in government today. So it’s about so many characters, not particularly government people, officials. 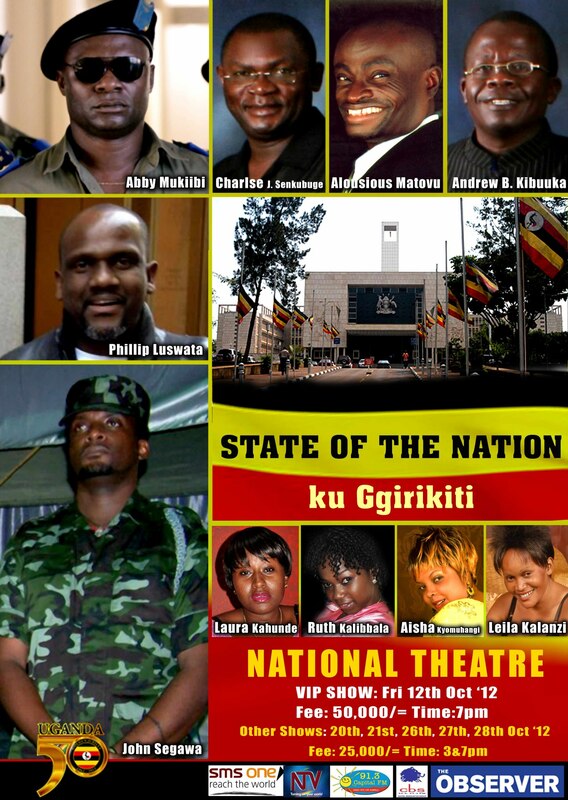 Why has the Media Council taken such exception to this play, State of the Nation? You know the problem here – too many people are worried about nothing. Everybody is worrying. I don’t know why. Because we talk about corruption, we talk about nepotism, so many other things. What they tell us – we are inciting people, we are sectarian in the play and that we are ridiculing government officials. That’s what they are talking about. But we had requested them to come and watch the play and nobody turned up. So, I don’t know, what’s the problem? Did you intend for the play to have this kind of incendiary effect? Yes, because some of the lines talk about a ‘bitter pill’. When you talk about a ‘bitter pill’ then definitely you have to have repercussions, so that’s what we’re feeling today. It is sad, but what can we do? We intend not to stop showing this play because what we are saying is, this is some old production. It’s not new. It has been on for about a month now. If they wanted to preview it, they would come and do it. But I don’t know why they are worried. If there are a few lines they wish, we can do away with, then we can discuss it. But we don’t just stop, because we employ a lot of people and we have bills to pay. We have issued cheques, for media houses and so many other things. We cannot just stop. You cannot just deny us employment because you are worried about a certain line or two. If Ugandans can’t go to the theatre to watch plays that they want, then what are they doing to do for entertainment? That’s the worry today because if you can stop us today from staging this production, tomorrow you stop a song from playing on a certain radio. Then theatre is dead. Somebody cannot write a political play. There is a lot of comedy in Kampala. And the characters that are comic represent a few government officials here in Kampala. So are you going to stop everything? That’s the question. Uganda’s Media Council, they aren’t fans of drama? They have a lot of work to do. They should perhaps do their job and learn about drama. Drama is on a small scale in Kampala and there are bigger radio stations that play not so good music. There are television stations that show not so good programmes for kids and so many other things. Let them go to that. Because drama is such a small scale in Kampala. So why are they worried? You said that this play has already been staged. What’s been the reception amongst Ugandans? What do they think? Is it a funny play? Is it thought-provoking? It is both. It is provoking. It is funny. It is entertaining. There is dance. There is comedy. There is sarcasm. I mean, it’s some piece of entertainment! It has that appeal. It represents a few people and when you talk about corruption they don’t like it. There’s a time when we talk about our runner [Stephen] Kiprotich winning the gold medal and we say that’s the best we can show for Uganda. They don’t like it. But it’s the truth. Do you think the President Yoweri Museveni could maybe identify himself in this play? I don’t want to talk about him because the directives are not from State House. The directives are from the Media Council. I don’t want to talk about the president. You’re going to go ahead and stage this production this weekend, I believe, and defy the ban. Are you concerned about the consequences? We are. We’re worried, we’re concerned. But we have legal representation. If they arrest us then we can talk about the law now, if it is the law. We have legal representation. We are not worried. Is it unconstitutional, this ban? We feel it is because what they are quoting from the law is, they are only supposed to censor and they are not supposed to stop. That’s what it reads and that’s what we read. That was the interpretation of our lawyers. You don’t stop. You censor. And censor is about discussion of what you like and what you don’t like. But you don’t stop. The law does not tell them to stop. And what they said, they said they were going to use the police to stop us. This means they don’t have the mandate to do so, if they are using the police. Will opposition leader Kizza Besigye come and see State of the Nation? He came and watched it and he liked it. I think maybe that’s the problem. But isn’t he supposed to watch a production, a play?